With her new TBS show, “Full Frontal With Samantha Bee,” Bee puts her trademark — a wonderfully biting irony — on display. With the arrival of “Full Frontal With Samantha Bee,” it’s time to alter the metaphor. We’re accustomed to referring to “the late-night TV landscape,” but at this point, “the ever-changing late-night ocean” might be more accurate. In recent years, we’ve seen late-night TV in a state of constant motion, with the comings and goings of Stephen Colbert, Jimmy Fallon, David Letterman, Jay Leno, Trevor Noah, Jon Stewart, Seth Meyers, and Jimmy Kimmel. After many, many static years, the genre has found new energy. With Bee joining the fray as host of a weekly show on TBS, the new energy reaches a greater level of appeal. Partly that’s because, with Chelsea Handler out of the picture for now, Bee is the only woman in the field. She probably wouldn’t want me to make that point; the opening of “Full Frontal” was set at a fake press conference, where every question for her was about breaking into the boys’ club. One reporter asks, “What’s it like to be a female woman?” Bee’s response triggers her wonderfully biting irony: “We’re all witches,” she says. Her regular returns to sexism, though — including a segment on Senator Mitch Holmes of Kansas, who’d introduced a committee dress code directed at women — suggest that her presence in the boys’ club will indeed be different and invigorating. Bee’s appeal in late night is also thanks to that same wonderfully biting irony, her trademark, which I’ve sorely missed since she left “The Daily Show With Jon Stewart” after 12 years. She was one of the best and brightest correspondents on “The Daily Show,” and she puts that same sharp, clever, unflinching sensibility front and center on “Full Frontal.” It helps that she is backed by dexterous writers who slip in a lot of wily asides — “I dislike Ted Cruz as much as the next everyone” — while making larger points. My favorite Monday night: A passing reference to Donald Trump as a “sentient caps-lock button.” She delivers those lines with distinctive zing. The “Full Frontal” format closely recalls “The Daily Show” in its focus on politics and its reliance on news clips, but instead of sitting at a desk, Bee stands in front of the audience. That’s a small adaptation, but it feels right: By standing and moving around, she brings both a sense of piercing directness — the full frontal approach of the title — and the ability to use her body language unhindered by furniture. The former “Daily Show” correspondent’s new TBS show debuts Monday. Monday night, she led us through the campaign in New Hampshire, “where democracy goes to freeze to death,” first walking us through jokes about the Democratic candidates — including Hillary Clinton’s false modesty — and then moving on to the Republican candidates. She introduced a semi-regular feature called “Elected Paperweight of the Month,” the piece that took on Holmes. And she finished with a grim art-film parody about Jeb Bush’s campaign, including, of course, his famous “Please clap” moment. It was as sad as it was funny. 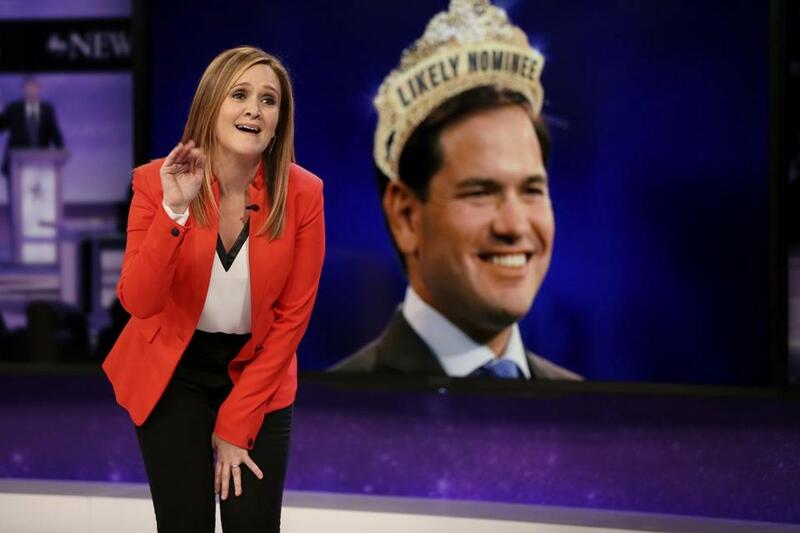 The downside to the promising “Full Frontal With Samantha Bee” is that, with a weekly show, Bee seems doomed to cover material — such as Bush’s “Please clap” moment — that has already gone viral, been turned into GIFs, and been captioned in social media with seemingly every joke possible. John Oliver has solved that problem on his weekly series “Last Week Tonight” by wandering away from daily concerns to report on bigger, less-covered stories. Bee did just a tad of that with her Holmes piece, but still, the bulk of the episode was rooted in headlines and memes we’ve already encountered ad infinitum. It’s great that she has arrived during the campaign, but she’ll need to deal with timing issues. That, or TBS needs to give her a nightly slot. On TBS, Monday at 10:30 p.m.